Sustainable lab created diamond bezel set earrings. Available options: platinum, 14k or 18k gold: white, yellow, rose. Each piece of Ada Diamonds fashion jewelry is custom made to order with sustainable, conflict-free lab diamonds. 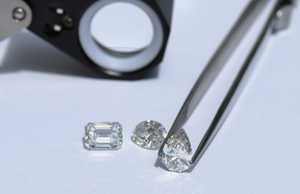 See why our exclusive Concierge Experience is redefining the diamond industry. Ada Diamonds Design Description- This glamourous pair of stud earrings includes a matched pair of round brilliant lab grown diamonds in a 14kt white, yellow, or rose gold bezel setting.